Bronze, grey-green patina, solid cast. 5th century BCE. Height: 11.3 cm. Vienna, Museum of Art History, Collection of Classical AntiquitiesInv. No. VI 425. Unknown; Etruscan, acquired in 1865. The young man, portrayed with vigour and in detail, is standing with his right leg forward, heel raised. The weight of the body is on the left leg. The rather flat face with its large eyes, prominent cheeks and thin smile, the cap-like hair, the broad shoulders and the thickness of the thighs are archaistic in style. The hands are disproportionate to the body. 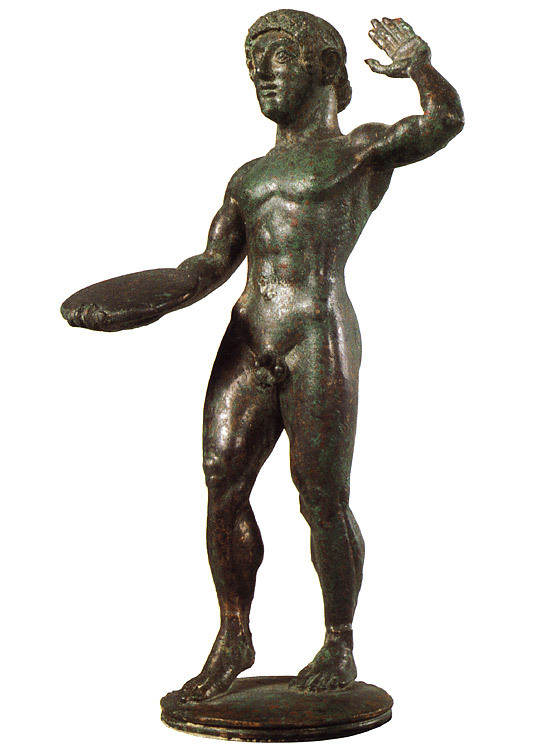 The athlete demonstratively holds the discus flat in his outstretched right hand. The left hand is raised as in a greeting. Is he the victor? K. Gschwantler, Guss und Form — Bronzen aus der Antikensammlung (Vienna, 1986) no. 59 p. 66. © 1993. Photo, text: Olympism in antiquity. Olympic Museum Lausanne. Bertelsmann UFA. Industria Gráfica S. A. Barcelona, 1993, p. 99 cat. no. 42. © Photograph — I. Kitbitschka (Kunsthistorisches Museum-Vienna).